We’re fortunate to have an extensive paved trail system in our area. The trails connect with broad sidewalks in many places, giving both safe recreation and transportation space for walkers, runners, and bikers. This morning we went for a walk in our neighborhood, looping away from our house to the west, then northward around a pond, and back in on a deer trail behind the house. The birds make a joyful noise this time of year, attracting mates and defending nests. Redwinged blackbirds trill, wrens chatter, and the red-bellied woodpecker repeats its hoarse, cough-like call. We hear birds we can’t see, and even the birds we see, we can’t always identify. Today’s first notable bird-spotting was a male Eastern Bluebird. They like areas that are mostly open. It was perched on a small tree, but it flew away before Jim could capture it with the camera. Beyond that, above the tall trees, floated a red-tailed hawk. Jim especially hoped to photograph a meadowlark today. We often see them in the grassy areas, but they don’t stay still very long for photos. 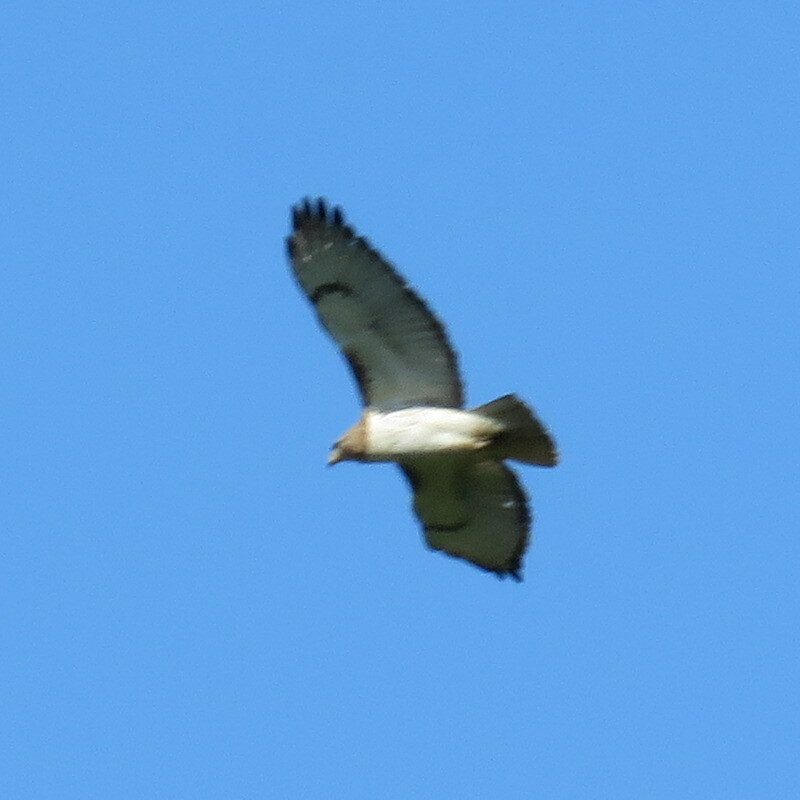 Instead we saw a speckled bird (little brown jobbie?) a bit smaller than a robin. Any ideas for identifying this one? On the way back toward the house in an area more thickly wooded, we both heard a mystery-bird. High in the trees, we couldn’t see it. We kept moving toward the sound until we found the correct tree. 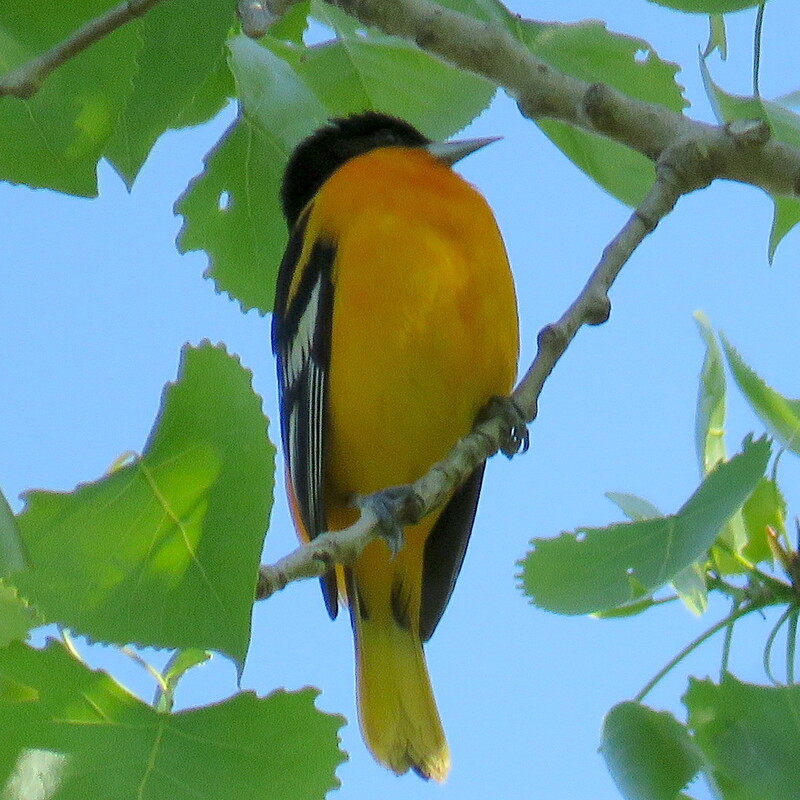 The song tripped my memory and I said, “It’s an oriole.” Why I was so certain, I don’t know, as we don’t enjoy orioles around here much. But that gave us a color to look for. The bright orange of these birds would make it easier to spot. Finally Jim saw it and was able to get a couple of good photos. Handsome fellow, isn’t it? I remember long ago hearing a radio talk show. The hosts were visiting with a caller who talked about birding outings, and how they sometimes would have blind people join their group. The radio hosts were surprised that blind people could identify birds. In fact, often the call is the easiest way to “spot” them. One last note, if you aren’t aware of the great website All About Birds, you should take a look. It’s like having the best bird book ever, including audio recordings to boot. 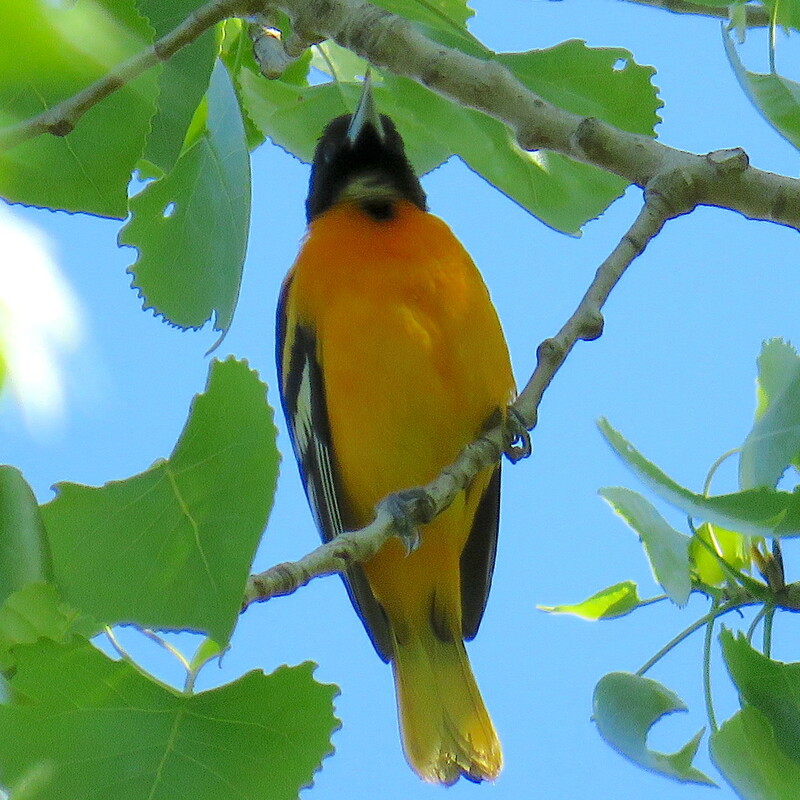 This entry was posted in Backyard, Birds, Photography and tagged All About Birds, Baltimore oriole, Little brown jobbie, Red-tailed hawk on May 5, 2017 by Melanie McNeil. One morning in February we had an unexpected visitor. A great horned owl perched behind our house, fending off harassing crows with its dignified, quiet pose. Though we’ve lived in this house for almost 15 years, we’d never known a great horned to stop here before. As excited as we were, we also were a bit concerned. I’d read that great horned owls and barred owls don’t share habitat. If the great horned was here, did that mean we’d no longer welcome our old friends, the barred owls? There was no need for concern. 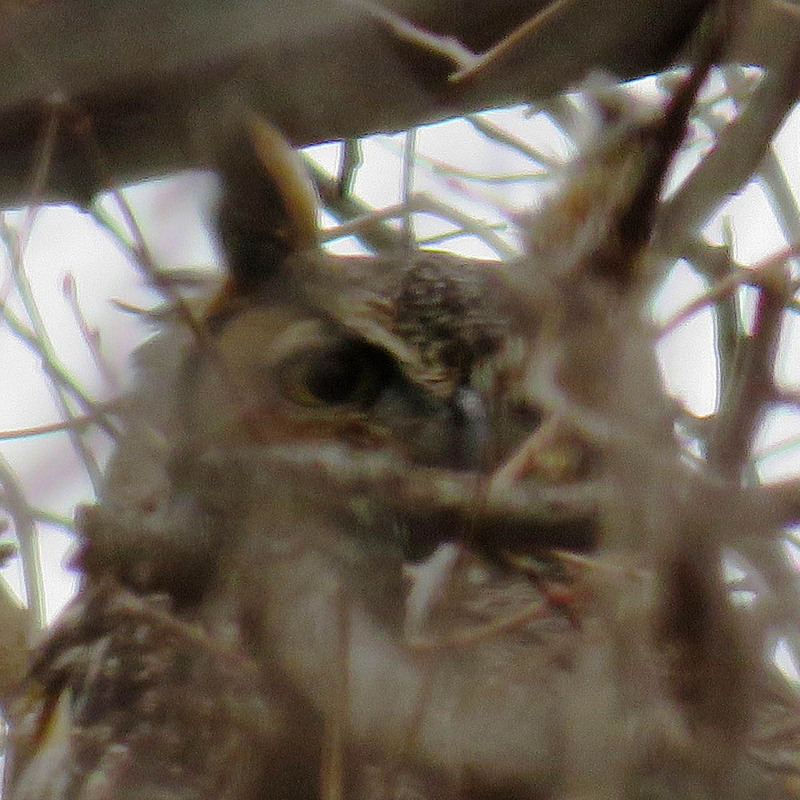 The next day, the great horned owl was nowhere to be seen. 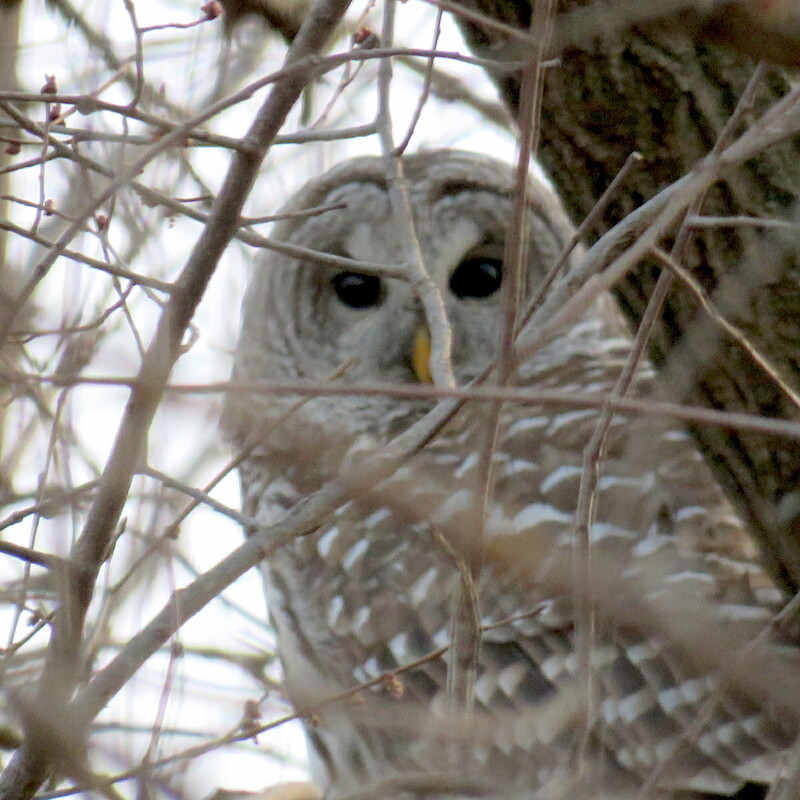 Within a couple of days, we heard barred owls in the woods again. On March 2 I opened the garage door to ready trash for pickup. As I did so, I heard a barred owl. It was close and sounded like it was across the street. I stepped out into the cool morning air, sky brightening but still dark before sunrise. 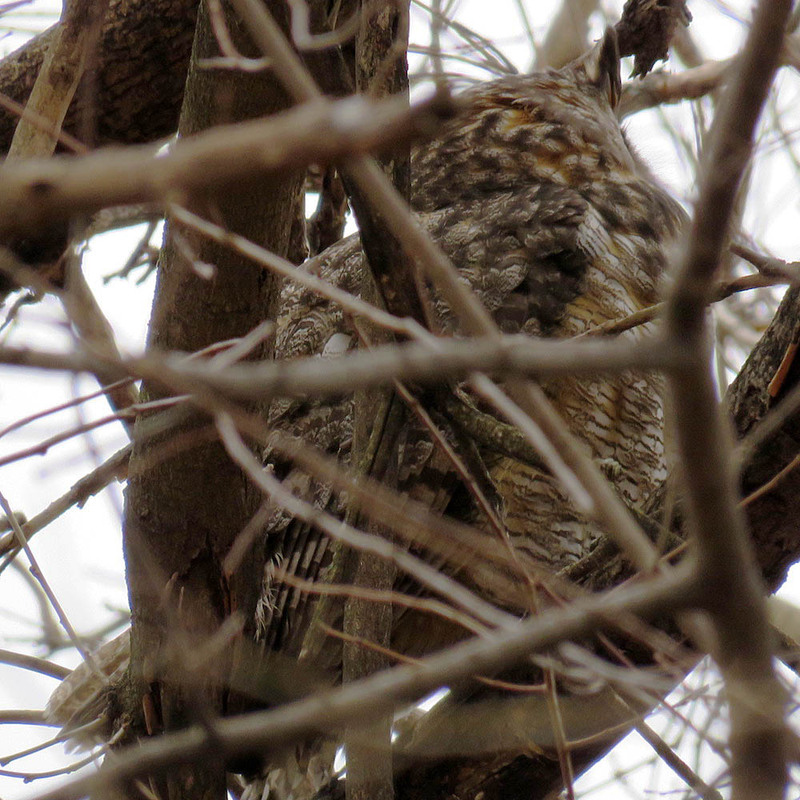 The owl loudly called again as I searched for it, and I realized it was behind the house rather than in front. The echo had fooled me. I hurried to the side yard in time to see one land in the neighbor’s tree. I ran in to tell Jim, and he was able to see it, too, through the window. 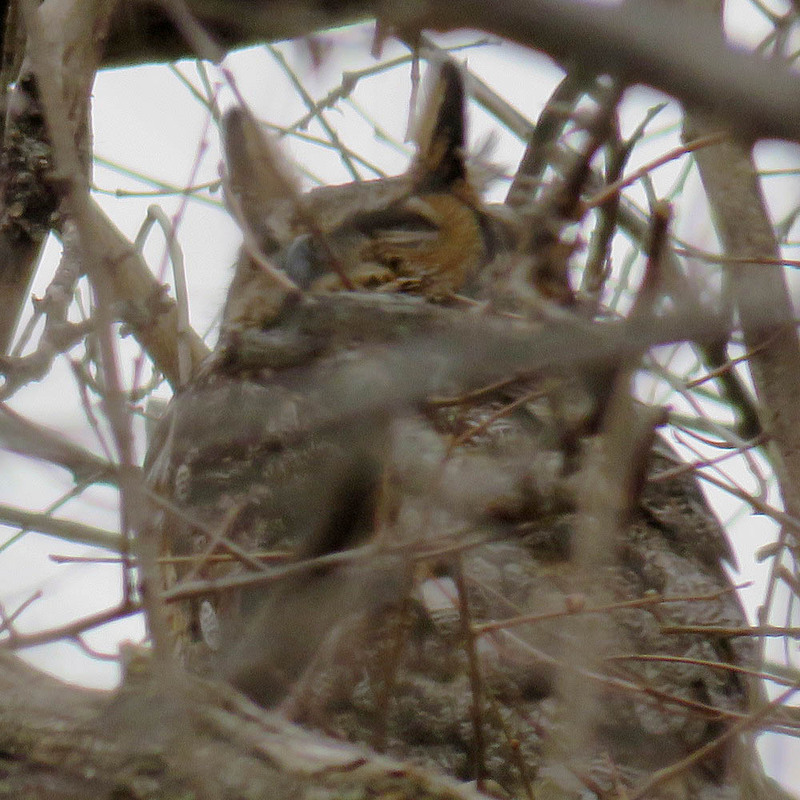 Well, no need to worry about the great horned owls chasing the barreds out of the neighborhood. We had one a few feet from our house. We looked in the direction of the call. 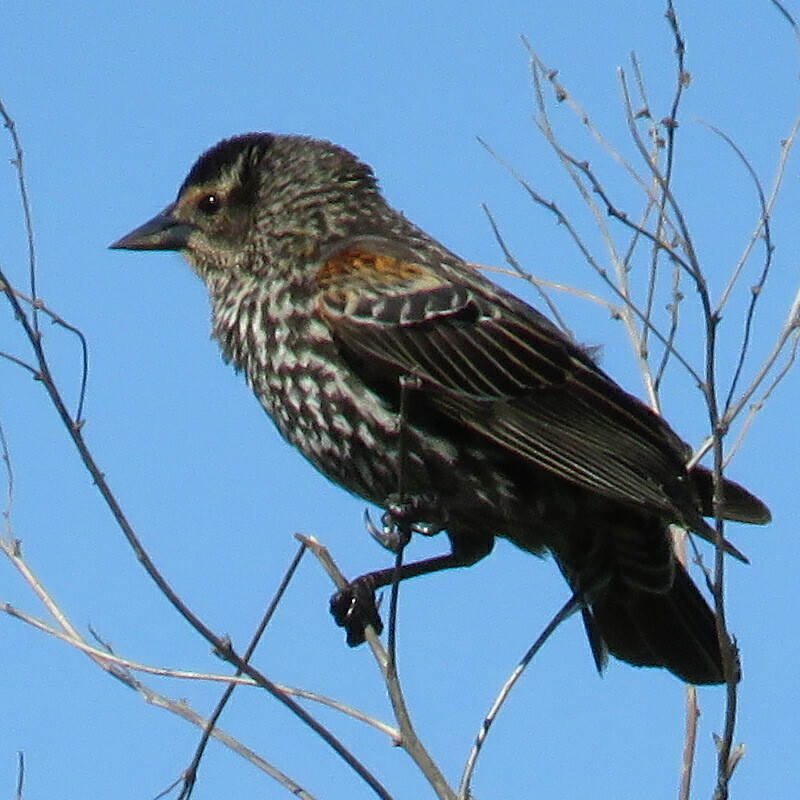 There on a branch, about 30 feet from the house, was this beautiful bird. Barred Owl. Iowa, March 2, 2017. Photo by Jim Ruebush. Jim also got a few seconds of video. Since then we’ve heard these wonderful birds nearby several times. We’re fortunate to share our yard and close green space with them, and with the occasional unexpected visitor. This entry was posted in Backyard, Birds, Nature, Photography and tagged Barred owl, Great horned owl, Owl on March 18, 2017 by Melanie McNeil. This morning as we readied for an errand, we heard a great commotion rise up behind the house. Crows, screaming bloody murder, shrieked in alarm. I thought there were several, maybe dozens of them, the cries were so loud. But when Jim looked, he saw only two. Two angry crows, screaming at something between and below them. There are a number of cats that roam the neighborhood. Sometimes we hear squirrels or blue jays yelling at a wandering cat, but usually not crows. Even if there were a cat, the crows were high enough in the tree that a cat wouldn’t threaten them. It seemed unlikely that a cat was the cause. Still they continued cawing and screeching. A tree blocked our view, so we moved to another window. Jim thought he saw another bird on a branch below them. Cooper’s Hawks occasionally visit our yard. They eat small birds and mammals. Once we watched as a Cooper’s dropped onto a squirrel, latched its talons tightly in, and flew away with it. With that risk, the little birds go silent and scarce when a hawk is around. Binoculars showed the cause for alarm more clearly. It wasn’t just “another bird.” It was an owl. Since we moved to this house 15 years ago, we’ve been visited by barred owls. They aren’t as frequent as they used to be, but we still open the door to the screened porch in almost any weather to hear them calling to each other. A shift to yet another window gave an even better view. This owl had ear tufts. It was no barred owl. It was a great horned owl! We’ve never heard nor seen one around here before! 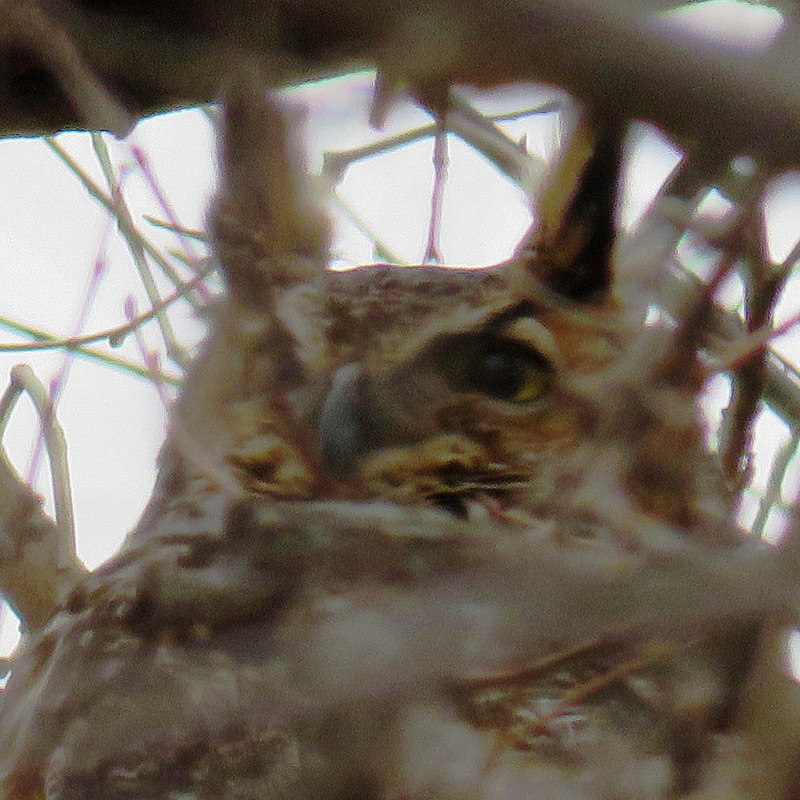 I’ve read that barred and great horned owls don’t share habitat, and that the horned owls get first dibs. I don’t know what this means for our barred owl friends, or if we’ll get to enjoy their occasional visits again. Jim was able to get a few pictures of this beautiful bird. 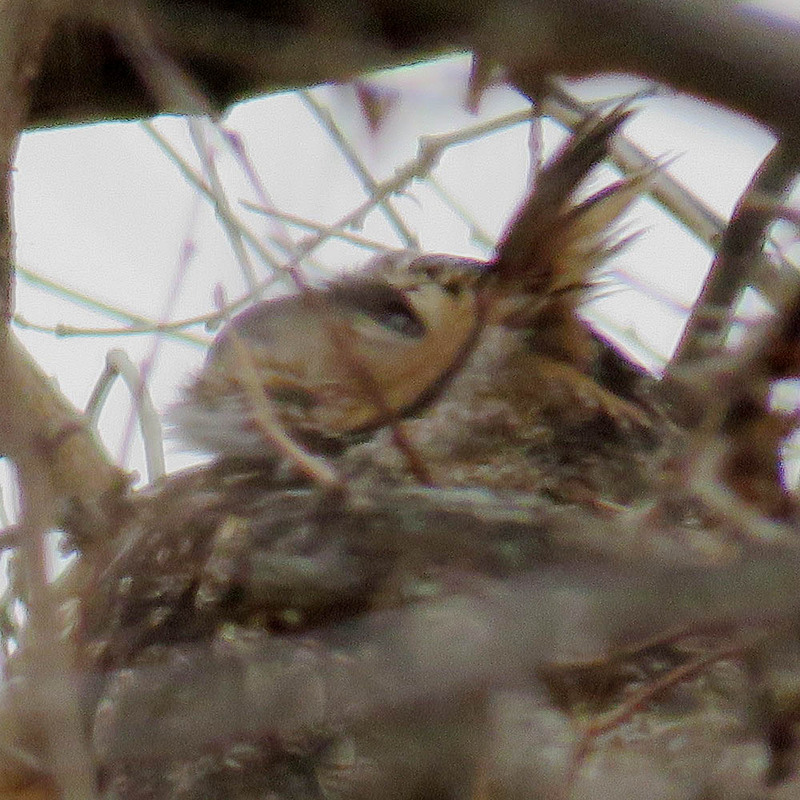 Though they are unfocused, you can clearly see the large ear tufts and hooked beak. He took this photo from below. It shows the feathering better. As I write this several hours later, the owl is still perched in the same place. The crows gave up pestering and screaming long ago, though they’ve made a few more half-hearted attempts to intimidate. This entry was posted in Backyard, Birds, Outdoors, Photography and tagged Crows, Great horned owl, Owl on February 23, 2017 by Melanie McNeil. 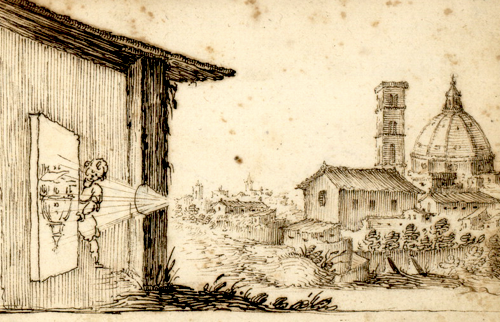 A previous post of mine was on the topic of the Camera Obscura, a forerunner to photography and camera technology. Our granddaughter used the idea to create a project for her school science fair. She obtained three images which were excellent examples of her results. As a proud grandparent, I get to boast. 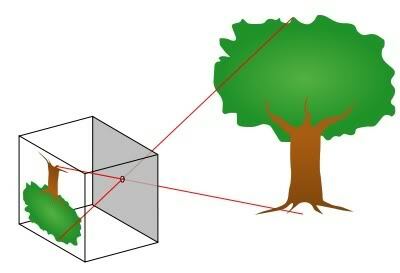 Camera Obscura is a simple device consisting of a light-tight box with a hole in one wall. The hole allows inverted and reversed images to be cast on the opposite wall. The box can be small or as large as a room. The image below is the basic idea. She used her bedroom as the box. This entry was posted in Photography on January 16, 2016 by Jim R.
This entry was posted in Photography, Technology on October 18, 2015 by Jim R.
This entry was posted in Astronomy, Photography on September 29, 2015 by Jim R.
Up before the Sun. It rises later now. Venus passed the Earth and is now bright in the morning sky. Welcome back. NASA posted this as their Image of the Day for 8 Sep 2015. It shows the silhouette of the International Space Station passing in front of the Sun as viewed by Bill Ingalls. He was in Shenandoah National Park, Front Royal, VA on 6 Sep 2015 to capture it. On board were 9 astronauts traveling 5 miles per second. NASA | Bill Ingalls | NASA astronauts Scott Kelly and Kjell Lindgren, Russian Cosmonauts Gennady Padalka, Mikhail Kornienko, Oleg Kononenko, Sergey Volkov, Japanese astronaut Kimiya Yui, Danish Astronaut Andreas Mogensen, and Kazakhstan Cosmonaut Aidyn Aimbetov. This entry was posted in Astronomy, Photography on September 11, 2015 by Jim R.
Earlier this month we visited our son in Washington. (See posts here and here. Please, wear your helmet. Really.) People who live there enjoy outdoor adventures all year long. The mild weather, ocean and other waterways, and the Cascade Mountain range provide lots of opportunities to get out. We were out a lot, too. One of our primary goals was to hike at Mt. Rainier National Park. 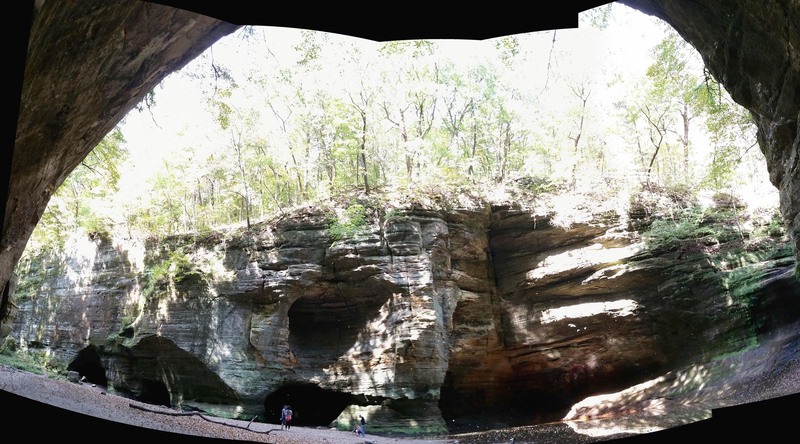 This entry was posted in Outdoors, Photography, Travel and tagged Hiking, Mt. Rainier, Mt. 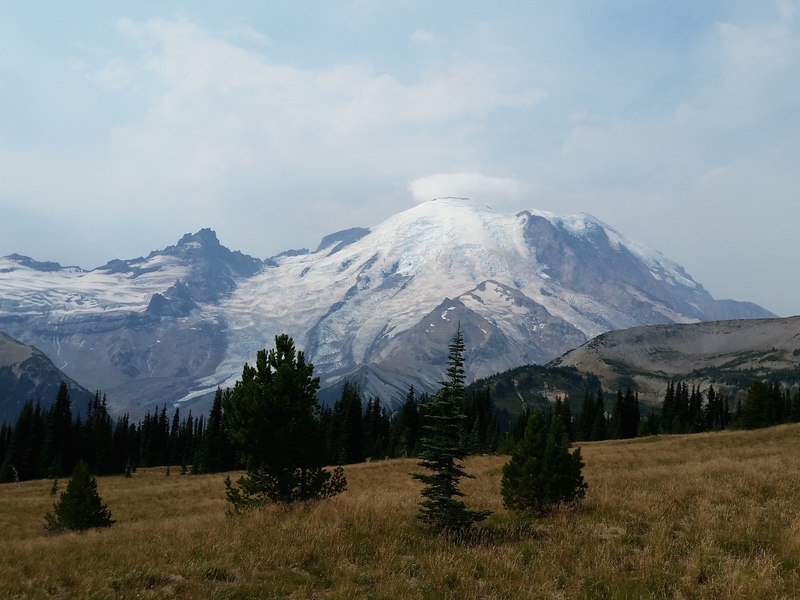 Rainier National Park, National parks, Photography on August 28, 2015 by Melanie McNeil. Some photographers have long telephoto lenses which allow them to create highly magnified views of small objects like comets. Others attached their camera body directly to their telescope. These days, their cameras have a CCD array instead of film. The CCD is able to capture color images using red, green, and blue light. The electronic signals are mixed in the camera to produce the colors we see in the photographs. Most of the images available for Comet Lovejoy at Spaceweather.com are in color. The comet appears as a faint blue-green object like this fine example. This entry was posted in Astronomy, Photography on January 18, 2015 by Jim R.